Welcome to the Mona Lisa House, a 3Bed / 3Bath home in Laurel Canyon / Wonderland K-5 School. The MLH offers the Very Best of Canyon Living. Located on a long cul-de-sac. The MLH is the center piece of the Lower Crescent Dr, as the tallest house and furthest out on the street the MLH has endless Canyon views out every window. The house faces So East the Morning Sun is Glorious, Features a large dance studio, Jacuzzi and 4 hole putting green . The house is 2001 Sq ft. on a 2600 ft lot, there's no need for a regular gardner here. A special assets of the MLH...No Neighbors close enough to be in your business. The house is above the house in front of it, below the house in back, the neighbor to the left 30' away and the house towers over the neighbor to the right. It's Blissful never needing to use Curtains. Silent Starry Nights and Privacy are here at the MLH. If like me you're an Artist, you'll find the house helps you get in your creative space organically. If you have business in Hollywood or Studio cCity, you're about 8 minutes away from being right in the middle everything. 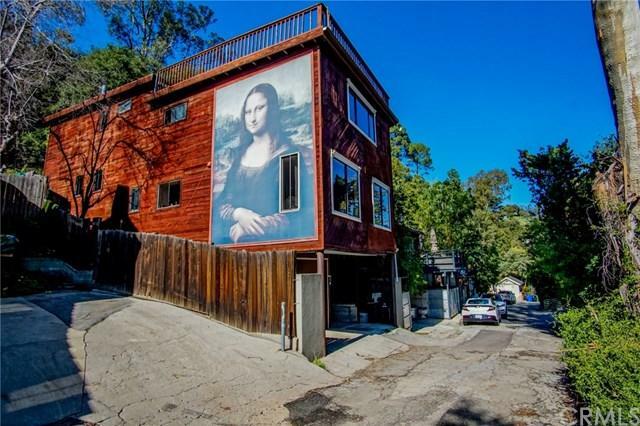 Mona Lisa is posed in a canyon and looks right at home here while protecting the most Sun baked portion of the house. I could write a book about the majesty and splendor of canyon living, but it's something you have to experience to feel and understand. The MLH gives you an opportunity to live your Best Life.